PT Bank BNI Syariah - BNI Syariah is a well-established financial services company in Indonesia with core competencies in the field of sharia banking industry. Its business activities focused in four sectors: commercial business, consumer and retail business, micro business, trasury and international business. BNI Syariah is under PT Bank Negara Indonesia (Persero) Tbk (BNI Group), the third largest state-owned banks in Indonesia. At present, PT Bank BNI Syariah is 99.9% owned by BNI Group and 0.1% by PT BNI Life Insurance. Based in Jakarta, BNI Syariah runs its business through 49 regular branch offices, 19 micro branch offices, 98 regular sub-branch offices, 70 micro sub-branch offices, 17 regular cash offices, 17 functional offices, and 23 mobile services vehicles spread in all over Indonesia (as of December 2015). During the financial year 2015, BNI Syariah recorded excellent results. BNI Syariah managed to record a total asset of Rp 23,017.66 billion in 2015. Compared to the achievement in 2014, it was an increase of 18.09% from Rp 19.492.11 billion. BNI Syariah booked total net profit of Rp 228.52 billion in 2015, 39.98% higher as compared with Rp 163.25 billion in 2014, according to PT Bank BNI Syariah Annual Report 2015 as cited by JobsCDC.com. JobsCDC.com now available on android device. Download now on Google Play here. Please be aware of recruitment fraud. The entire stage of this selection process is free of charge. 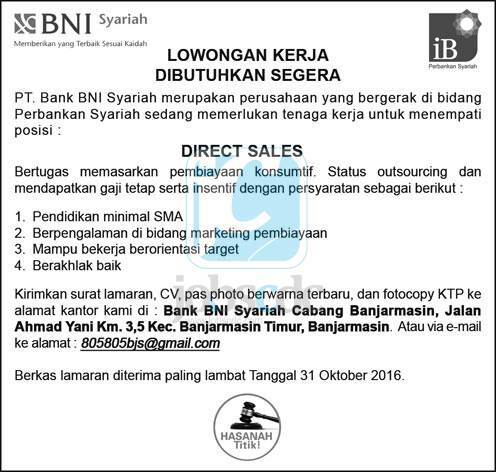 PT Bank BNI Syariah - Recruitment SMA Direct Sales BNI Syariah October 2016 will never ask for fees or upfront payments for any purposes during the recruitment process such as transportation and accommodation.